Editors are an integral part of a programmer’s life. If you have good proficiency in using an editor thats a great advantage. It comes very handy to debug. Traditional notepad and SOPs (System.out.println) are the way we start learning a language but that is not sufficient, so beginners start using an IDE and most importantly know the shortcuts. For java developers there is a huge list and some popular areEclipse, Netbeans, IntelliJ Idea. I use Eclipse as my IDE and vim as a light weight editor. This article is for those who use or intend to use Eclipse as IDE. Keyboard shortcuts are very important for comfortable and quick editing. I have abridged the following list of eclipse shortcuts from my own experience and literature. There is a huge list of eclipse shortcuts available but I have listed only the most essential ones that you may need daily. CTRL SHIFT R – Open a resource. You need not know the path and just part of the file name is enough. CTRL E – Open a file (editor) from within the list of all open files. CTRL PAGE UP or PAGE DOWN – Navigate to previous or next file from within the list of all open files. ALT <- or ALT -> – Go to previous or next edit positions from editor history list. CTRL SHIFT F – Format code. CTRL O – List all methods of the class and again CTRL O lists including inherited methods. 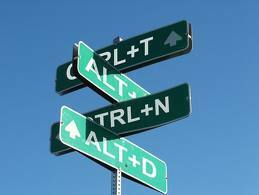 CTRL SHIFT O – Organize imports. CTRL SHIFT U – Find reference in file. CTRL / – Comment a line. F3 – Go to the declaration of the variable. F4 – Show type hierarchy of on a class. CTRL T – Show inheritance tree of current token. SHIFT F2 – Show Javadoc for current element. ALT SHIFT Z – Enclose block in try-catch. F12 – Focus on current editor. CTRL L – Go to line number. CTRL D – Delete a line. CTRL <- or -> – Move one element left or right. CTRL M – Maximize editor. CTRL SHIFT P – Go to the matching parenthesis. CTRL . or , – Navigate to next or previous error. CTRL F11 – Run last run program. CTRL 1 – Quick fix code.